The Precision 165 is intended to provide the most performance and fun possible within her builder's mandate for a low trailer weight and an especially reasonable price. This cannot be done with smoke and mirrors, so it must be done by focusing exceptionally hard on developing her most vital "fun features" while trimming away anything not truly essential. Towards this end, her cockpit is drawn large and deep for comfort and security, but her freeboard is kept low for reduced weight and cost. Her interior features comfortable berth space for two, a portable but cleverly concealed head, an ice chest and dry storage, but she makes no specious claim to have "full standing headroom." 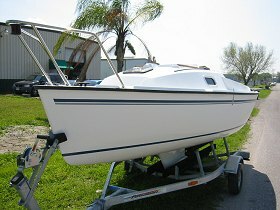 Her computer-modeled keel has an "end-plate effect" lead bulb for stability and efficiency to windward and shoal draft for easy trailering and launching. Her rig carries plenty of sail area for sprightly performance, but a simple three-stay rig for low weight, low cost and easy assembly. The full form of the Precision 165 features a contemporary stem profile that gives her both an especially long effective sailing length for high "top end" speed, and a very narrow entry angle for low added resistance in waves, but she shares the careful balance and dynamic stability that have earned the 15, 18, 21, 23 and 28 their well-earned reputations as sailing thoroughbreds. This office has produced a wide variety of designs, most much larger than the Precision 165. however, like all of our designs for Precision Boat Works, this latest effort is not less significant to us only less big. They have built all of our Precision designs with meticulous care, and we are proud of each and every one of them. We are confident that the new Precision 165 will quickly earn an equally enthusiastic following among yet another large and loyal group of new Precision owners.